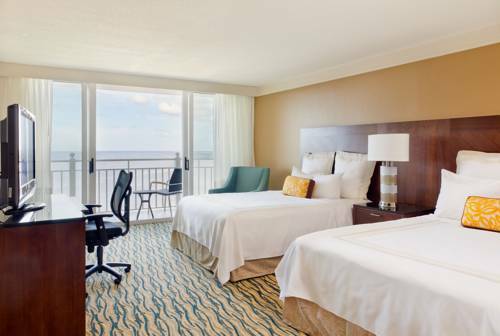 Experience the best of HHI from Hilton Head Marriott Resort & Spa. Ideally situated directly on the beach - with more ocean view guest rooms than any other Island resort - our welcoming hotel is the perfect choice for every traveler. Discover endless opportunities for fun, from playing one of three PGA golf courses, swimming on the beach or in our indoor and outdoor pools, playing tennis and going for bike rides to unwinding at our exquisite spa. Savor fresh seafood and South Carolina favorites at Blue or sip cocktails at one of our seasonal cafes. If a business event or social gathering brings you to our Hilton Head resort, you'll find contemporary meeting venues, including the area's largest ballroom, outdoor spaces and a host of superior services and amenities. When it's time to relax, our inviting rooms and suites await, each with a private balcony and thoughtful touches. Whether visiting for work or enjoying a beach vacation, we look forward to making your stay at our Hilton Head resort exceptional. The Cafe: Fuel up for a busy day of exploring Hilton Head at our inviting Palmetto Dunes restaurant. Sample from our extensive buffet or order from our tempting menu for breakfast and lunch. Blue: Savor deliciously fresh seafood and traditional favorites crafted with a twist at our sleek restaurant. The casual but upscale setting is the perfect spot for gathering with family, enjoying lunch between meetings or sipping cocktails in our lounge. Ocean Blu: There's no need to leave the beautiful Hilton Head sunshine to grab a bite to eat or a refreshing drink. Our seasonal poolside restaurant offers salads, sandwiches and fresh seafood. Join us after day at the beach or golfing at Palmetto Dunes. Liquid: Soak up the breeze and admire the scenery from our seasonal oceanfront bar and restaurant. Enjoy creative drinks, cocktails and a light bite at our vibrant outdoor lounge.